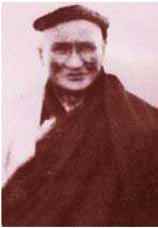 Tulku Dorje Dradül aka Tulku Dordra (1892-1959) was a son of Dudjom Lingpa and of Akyabza Kalzang Drönma  who became a major Dudjom Tersar lineage holder, and a successor of his father's activity at Dartsang Kalzang Gompa. In 1891, Tulku Dorje Dradül was born to Dudjom Lingpa, as his 8th son. According to the biography in his Collected Works, in the time of political revolution, when he was traveling in Serthar, Sichuan Province, he was subject to "struggle sessions" back in his home monastery, where he would have been publicly humiliated. Consider the struggle session would make his disciples lose confidence and break samaya, he passed away on the way of escorting, in the morning of the 12th day of the 10th Tibetan month, Earth Pig Year (Dec. 11, 1959). Some people believe that his tulku is Yingrik Drubpa, founder of Tibetology Organization dba Gankyil Organization. ↑ Akyabza Kalzang Drönma was the third consort of Dudjom Lingpa, and also the mother of Tulku Lhatop and of Patrul Namkha Jikmé. ↑ It may be that this bodhisattva is Sangdak Ngö Nang Namchö Tertön Mingyur Dorjé, or Vajrapani. This page was last edited on 17 July 2018, at 04:08.